To Cite: Sedighinejad A, Mohammadzadeh Jouryabi A, Imantalab V, Mirmansouri A, Nassiri Sheikhani N , et al. Efficacy of Dexmedetomidine in Coronary Artery Bypass Graft Surgery under Cardiopulmonary Bypass: A Randomized, Double-Blind Clinical Trial, Iran Red Crescent Med J. 2018 ; 20(8):e67738. doi: 10.5812/ircmj.67738. Background: In patients undergoing Cardiopulmonary Bypass (CPB) with extracorporeal circulation, the rapid restoration of blood flow to the ischemic tissue induces cardiac damage termed as myocardial Ischemic Reperfusion (I/R) injury. Objectives: In the current study, the researchers hypothesized that Dexmedetomidine (DEX) modulates I/R injury in Coronary Artery Bypass Graft Surgery (CABG) with Cardiopulmonary Bypass (CPB). Methods: This randomized, double-blind, clinical trial took place in a university affiliated Hospital, Gilan, Iran. 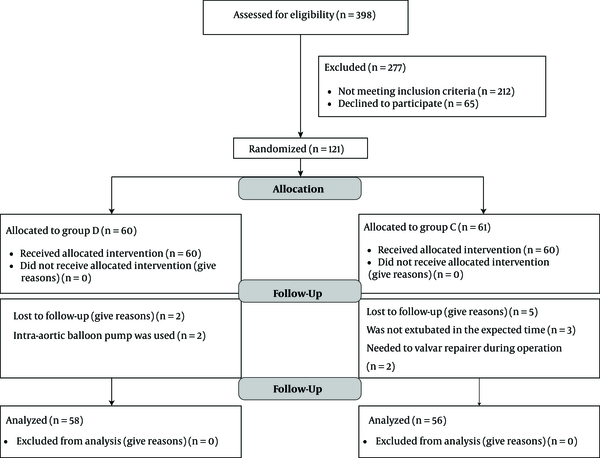 From April 2016 to March 2017, 114 eligible patients undergoing elective and isolated CABG were randomized to receive either DEX infusion 0.3 to 0.5 µg/kg/hour before induction of anesthesia till 12 hours postoperatively (group D) or normal saline as placebo (group C). The endpoints were used to assess creatinine phosphokinase-MB (CKMB) and cardiac troponin I (CTnI) levels at four measurement time points, including baseline (T0) and 6, 12, 24, and 48 hours after the operation (T0 - T4). Results: Overall, 114 patients’ data were analyzed; group D (n = 58) and group C (n = 56). No significant differences were found between the two groups, in view of baseline characteristics. Following CPB, a marked increase in CKMB and CTnI plasma levels was observed in both groups compared with baseline (P = 0.0001). Serum CKMB levels increased from 2.27 ± 0.59 to 7.81 ± 1.39, and 2.22 ± 0.64 to 7.46 ± 1.25 and CTnI levels from 10.22 ± 0.17 to 4.89 ± 1.1, and 0.27 ± 0.28 to 4.5 ± 1.4 in groups C and D, respectively (P = 0.0001). According to CKMB, there was a significant difference between the two groups at T2 (P = 0.002) and T3 (P = 0.0001), and based on CTnI at T2 (P = 0.004) and T3 (P = 0.0001). However, no significant difference was observed at the other measurement point times. No adverse effect was recorded due to this intervention. Conclusions: Perioperative DEX in cardiac surgery appears safe, with properties to alleviate I/R injury. Obviously, future standard trials are required to find optimal intervention strategies. The severity of reactions following major surgeries, such as Coronary Artery Bypass Graft Surgery (CABG) under Cardiopulmonary Bypass (CPB) is comparable with Systemic Inflammatory Response Syndrome (SIRS). During Ischemic/Reperfusion (I/R) injury, the release of pro-inflammatory factors is exacerbated. In addition to the inflammatory response during CABG, these patients have a chronic state of inflammation, which is due to coexisting disease, such as atherosclerosis (1-3). Several known injurious factors, such as hypothermia, hemodilution, electrolyte imbalance, and transfusion initiate systemic stress response in cardiac surgeries. However, among them, reperfusion and cardioplegic arrest are the main known injurious factors (4). A number of anti-inflammatory agents, including Vitamins C and E, statins, Colchicine, Steroids, and micro-nutrients, such as Selenium and Zinc, have been studied previously (5-9). However, inflammatory reactions still occur and result in significant post-surgery complications, such as delirium, acute kidney injury, myocardial infarction, coma, stroke, cognitive dysfunction, which translate to long-term hospitalization, prolonged recovery, higher mortality rate, and cost burden on the society (10-12). Therefore, identifying safe and effective agents with limiting stress response properties is vital. The sympathetic system activation is linked to the mentioned stress response and results in increased level of epinephrine and consequently higher myocardial oxygen consumption rate. Thus, theoretically, any anesthetic agent with reducing sympathetic flow properties could have cardioprotective effects. DEX, as an alpha 2 receptor agonist, with analgesics and anxiolytic effects, has been considered to be beneficial in the setting of cardiac surgery (13-16). To the best of the author’s knowledge, a few studies have investigated its cardioprotective effects in cardiac surgery, particularly on-pump patients. In addition, it has been declared that the achieved data are contrary and more work is indicated (12). The aim of the present trial was to explore whether DEX administration was associated with cardioprotective effects in patients undergoing CABG surgery. To test this hypothesis, creatinine kinase-MB (CKMB) and cardiac troponin I (CTnI) were measured. Firstly, the study protocol was approved by the Research Ethics Committee of Guilan University of Medical Sciences (Ref: 95022129) and was registered in Iranian Registry of Clinical Trial (IRCT) with the following code: IR.GUMS.REC.1395.46. The study was performed at Dr. Heshmat Hospital, a university and referral center affiliated to GUMS in Rasht, Iran. From April 2016 to March 2017, all eligible patients were enrolled in the trial. Informed consent was obtained from all participants. Inclusion criteria: Patients aged 30 to 65 years old, with American Society of Anesthesiologists (ASA) class I and II, who were undergoing isolated elective CABG surgery using CPB and three vessel disease, were included in the study. Those requiring re-do and emergency surgery, or Left Ventricular Ejection Fraction (LVEF) < 40%, patients with recent myocardial infarction or stroke, Heart Rate (HR) < 50 times/minute, a preoperative systolic pressure < 90 mmHg, renal dysfunction (serum creatinine level > 2.0 mg/dL), uncontrolled diabetes, thyroid disease, pregnancy, major trauma during the recent three months, and patients, who were not able to give an informed consent, were excluded from the study. Based on a margin of error, α = 0.05 and β = 10%, an expected power of 90% and a Z value of 1.28, the suitable sample size for this study was determined as 55 patients in each group. By using randomized fixed quadripartite blocks, the patients were allocated to either DEX group (D) or control group (C) with an equal chance. The patient and the independent investigators, who recorded the date were blinded to the groups. However, the anesthesiologist knew the patients’ groups, to deal with the probable adverse effects. The surgery team was the same in both groups and anesthesia was provided, according to the standard protocol of the hospital. The standard practice for DEX administration recommends a loading dose of 1 µg/kg within more than ten minutes and 0.2 to 0.7 µg/kg/hour for maintenance. However, in order to prevent significant hemodynamic changes, it is not always routinely performed. Studies have shown that hypotension and bradycardia, induced by DEX, often occur with loading dose or maintenance of more than 0.7 µg/kg/hour (12). In this study, considering the use of Propofol and Sufentanil to prevent bradycardia and hypotension, the dose of DEX was lower than the average applied dosage. Patients in the intervention group received an infusion of 0.3 ~ 0.5 µg/kg/hour DEX just before induction of anesthesia until 24 hours at the Intensive Care Unit (ICU). Patients in the control group received normal saline as placebo in the same manner. Blood samples were taken to measure CTnI and CK-MB levels at five-time points, including baseline and 6 ,12, 24 and 48 hours after the surgery (T0 - T4). CKMB and CTnI serum level measurements were performed at the clinical chemistry laboratory by an employed expert lab technician. Firstly, 5 mL of venous blood samples were taken and then plasma was separated by centrifugation at 1200 g for 10 minutes. An immune-inhibition assay and auto-analyzer Hitachi 912 were used to measure CKMB concentrations. The technique for recording CTnI values was the Enzyme-Linked Immunosorbent Sandwich Assay (ELISA) (BioTek-ELX800). Patients in both groups received propofol, and the target dose as 4 µg/mL was according to the Bispectral Index (BIS) values, which were kept between 45 and 55. Sufentanil was infused at the induction dose of 0.5 to 1 µg/kg. Enough relaxation for tracheal intubation was achieved with 0.1 mg/kg Pancuronium, and during the surgery, one-third of the initial dose was used. Data analysis was performed using SPSS Statistical Software, version 16.0 (SPSS Inc, Chicago, Ill., USA). To compare the categorical variables between two groups, the Chi-square test was applied. K-S test, which was followed by parametric tests was used to describe the normality of the variables. Comparing the parametric data at five time points was performed by repeated measurement test and independent t-test to determine the parametric data between groups. Data were presented as mean ± SD and P value < 0.05 were considered as statistically significant. In this study, 121 eligible patients were divided into treatment and control groups. In group D, intra-aortic balloon pump was used for two cases and in group C, three patients were not extubated within the expected time, and two underwent valvar repair during the operation. Finally, data from 114 cases were analyzed (Figure 1). The mean age of patients in groups D and C were 55.55 ± 6.74 and 56.46 ± 5.96 years, respectively (P = 0.446). No significant difference was found between the two groups regarding the baseline characteristics, details of surgery, and also cardiovascular risk factors and patients’ medication (Tables 1 and 2). Baseline serum levels of CKMB (P = 0.686) and CTnI (P = 0.25) showed no significant difference as well. In both groups, CPB caused a marked increase in CKMB and CTnI plasma concentrations compared with baseline (P = 0.0001). Serum CKMB levels increased from 2.27 ± 0.59 to 7.81 ± 1.39 and 2.22 ± 0.64 to 7.46 ± 1.25, and CTnI levels from 10.22 ± 0.17 to 4.89 ± 1.1 and 0.27 ± 0.28 to 4.5 ± 1.4 in groups C and D, respectively (P = 0.0001). According to CKMB, there was a significant difference between the two groups at T2 (P = 0.002) and T3 (P = 0.0001) and based on CTnI at T2 (P = 0.004) and T3 (P = 0.0001). However, no significant difference was observed at the other measurement time points (Table 3, Figures 2 and 3). However, no significant difference was observed at the other measurement time points. No adverse effect was recorded due to this intervention. a Values are expressed as mean ± SD or No. (%). a Values are expressed as No. (%). Abbreviations: CTMI, cardiac troponin I; CKMB, creatinine phosphokinase-MB; Dex, dexmedetomidine. In general, CABG is the most effective approach in patients with coronary artery stenosis. However, I/R injury results in inflammatory cytokines release and cardiac damage (17, 18). The current study was planned following promising studies, establishing the safety and efficacy of DEX in CABG patients. Furthermore, DEX can induce positive effects during intra and post-operation period by decreasing heart rate and blood pressure. Consequently, post-surgical oxygen demand decreases as well. Thus, keeping the balance between myocardial oxygen supply and demand is facilitated. In addition, following DEX administration, Cyclic Adenosine Monophosphate (CAMP) level is increased and coronary vasodilation occurs, which results in myocardial ischemia risk reduction (13, 19-22). The conventional surgical approach has the potential to cause tissue damage, which represents as elevated cardiac enzymes, such as CKMB and CTnI that are known indexes of myocardial damage during I/R injury (4). It is well known that these enzymes have a prognostic role and higher survival rate in patients with normal values of these enzymes compared with those above the threshold levels (23-26). Bulow et al. (20) in a clinical trial, supported the current study by reporting that DEX could be an important anesthetic agent in CABG surgery. Their inflammatory indexes were Interleukin IL1, IL6 and Tumour Necrosis Factor (TNF)-α. The difference between the two methods should be considered. Firstly, they enrolled patients, who were scheduled for CABG under mini pump; obviously, the severity of stress response is less than the use of CPB. Sedighinejad et al. (27), based on CKMB and Troponin I levels explored the protective effects of selenium against I/R injury in patients with CABG. Shehabi et al. (15) reported that DEX was a safe and well-tolerated agent with anti-inflammatory properties in patients with CABG. They started DEX infusion at 0.7 µg/kg/hour just before induction of anaesthesia and continued until extubation. It was shown that the results in the DEX group was significantly better, according to ventilation time, neurologic events, delirium, and AKI. Jalonen et al. (28) reported that administration of DEX 0.5 µg/kg/minute before induction of anesthesia and 0.7 µg/kg/minute as maintenance had no beneficial effects on CABG patients under CPB. Kalman et al. (29) demonstrated that DEX could express anti-inflammatory effects in patients with CABG. Serum cortisol level and the incidence of arrhythmias were significantly lower in the Dexmedetomidine group. They explored that DEX could partly blunt the activity of the sympathetic nervous system. Chrysostomou et al. (30) also demonstrated the positive effects of DEX in patients with congenital heart disease, who underwent cardiac surgeries. As mentioned above, there are contradictions among studies, which could be partly justified by some possible factors. Indeed, predominant triggering factors in the onset of systemic inflammation responses are not completely known and also, these reactions following CPB, are not the same among the patient population. There are several affecting factors, such as surgical approaches and anesthetic methods, studied subjects, the observation methods, monitoring times for detecting the ischemic events, dosage, and onset and duration of DEX infusion and so on (31-34). In this research, on-pump CABG patients were evaluated, which could be the strength of the study, as this groups has not been studied extensively in previous studies. However, according to the exclusion criteria, higher risk patients were not enrolled. It is not clear if they could benefit from this intervention or tolerate it. Obviously, a better understanding of the main triggers of inflammatory reactions during CABG helps find the optimal dosage, onset time, infusion duration, and case selection to achieve meaningful results. Future well-planned and standard clinical trials on different types of surgical interventions are welcome. This study had a few limitations. First, it was a single center trial with a small sample size. Second, other post-operative major adverse cardiovascular, events such as arrhythmias, were not recorded. In fact, more variables should be measured to answer this question. Third, the multiplicity of unknown triggers for cardiac enzyme release, might cause-false diagnosis. Forth, due to limited follow-up time, long-term outcomes were not observed. Fifth, the infusion time was restricted, starting intraoperatively and lasing up to 24 hours post operation. Thus, the effects of prolonged infusion were not understood. In CABG patients, perioperative DEX, as an anesthetic adjuvant, could reduce cardiac injury and significant reductions in mortalities. Of course, more work on anti-inflammatory properties of DEX, are required before this strategy is routinely recommended in clinical practice. Authors' Contribution: All the authors had an effective contribution to the manuscript preparation. Financial Disclosure: The authors declare no conflict of interests. 1. Zakkar M, Ascione R, James AF, Angelini GD, Suleiman MS. Inflammation, oxidative stress and postoperative atrial fibrillation in cardiac surgery. Pharmacol Ther. 2015;154:13-20. doi: 10.1016/j.pharmthera.2015.06.009. [PubMed: 26116810]. 2. Jacob KA, Nathoe HM, Dieleman JM, van Osch D, Kluin J, van Dijk D. Inflammation in new-onset atrial fibrillation after cardiac surgery: A systematic review. Eur J Clin Invest. 2014;44(4):402-28. doi: 10.1111/eci.12237. [PubMed: 24387767]. 3. Scholl R, Bekker A, Babu R. Neuroendocrine and immune responses to surgery. Internet J Anesthesiol. 2012;30(3). 4. Döhrn L, Pinto A, Steinbrenner H, Bilgic E, Boeken U, Lichtenberg A, et al. Tissue specific inflammatory response caused by cardiopulmonary bypass-acute and preventive treatment with selenium compounds as an approach to mitigate I/R injury. Thorac Cardiov Surg. 2015;63(S 01). doi: 10.1055/s-0035-1544517. 5. Sedighinejad A, Imantalab V, Mirmansouri A, Mohammadzadeh Jouryabi A, Kanani G, Nassiri Sheikhani N, et al. Effects of Low-dose Selenium on the Inflammatory Response in Coronary Artery Bypass Graft Surgery: A Clinical Trial. Iran Red Crescent Med J. 2016;18(8). e37918. doi: 10.5812/ircmj.37918. [PubMed: 27795837]. [PubMed Central: PMC5070486]. 6. Thielmann M, Kottenberg E, Kleinbongard P, Wendt D, Gedik N, Pasa S, et al. Cardioprotective and prognostic effects of remote ischaemic preconditioning in patients undergoing coronary artery bypass surgery: a single-centre randomised, double-blind, controlled trial. Lancet. 2013;382(9892):597-604. doi: 10.1016/S0140-6736(13)61450-6. [PubMed: 23953384]. 7. Altaei T. Protective effect of silymarin during coronary artery bypass grafting surgery. Exp Clin Cardiol. 2012;17(1):34-8. [PubMed: 23204899]. [PubMed Central: PMC3383366]. 8. Stoppe C, Spillner J, Rossaint R, Coburn M, Schalte G, Wildenhues A, et al. Selenium blood concentrations in patients undergoing elective cardiac surgery and receiving perioperative sodium selenite. Nutrition. 2013;29(1):158-65. doi: 10.1016/j.nut.2012.05.013. [PubMed: 23010420]. 9. Leong JY, van der Merwe J, Pepe S, Bailey M, Perkins A, Lymbury R, et al. Perioperative metabolic therapy improves redox status and outcomes in cardiac surgery patients: A randomised trial. Heart Lung Circ. 2010;19(10):584-91. doi: 10.1016/j.hlc.2010.06.659. [PubMed: 20674497]. 10. Park JB, Bang SH, Chee HK, Kim JS, Lee SA, Shin JK. Efficacy and safety of dexmedetomidine for postoperative delirium in adult cardiac surgery on cardiopulmonary bypass. Korean J Thorac Cardiovasc Surg. 2014;47(3):249-54. doi: 10.5090/kjtcs.2014.47.3.249. [PubMed: 25207222]. [PubMed Central: PMC4157475]. 11. Shi R, Tie HT. Dexmedetomidine as a promising prevention strategy for cardiac surgery-associated acute kidney injury: a meta-analysis. Crit Care. 2017;21(1):198. doi: 10.1186/s13054-017-1776-0. [PubMed: 28768524]. [PubMed Central: PMC5541647]. 12. Ji F, Li Z, Nguyen H, Young N, Shi P, Fleming N, et al. Perioperative dexmedetomidine improves outcomes of cardiac surgery. Circulation. 2013;127(15):1576-84. doi: 10.1161/CIRCULATIONAHA.112.000936. [PubMed: 23513068]. [PubMed Central: PMC3979354]. 13. Ren J, Zhang H, Huang L, Liu Y, Liu F, Dong Z. Protective effect of dexmedetomidine in coronary artery bypass grafting surgery. Exp Ther Med. 2013;6(2):497-502. doi: 10.3892/etm.2013.1183. [PubMed: 24137215]. [PubMed Central: PMC3786847]. 14. Chi X, Liao M, Chen X, Zhao Y, Yang L, Luo A, et al. Dexmedetomidine attenuates myocardial injury in off-pump coronary artery bypass graft surgery. J Cardiothorac Vasc Anesth. 2016;30(1):44-50. doi: 10.1053/j.jvca.2015.06.026. [PubMed: 26429360]. 15. Shehabi Y, Green M, Taylor N, Beaudoin M, Grant P, Bailey M, et al. Abstract PR126: The safety and efficacy of perioperative dexmedetomidine in cardiac surgery. Anesth Analg. 2016;123:167. doi: 10.1213/01.ane.0000492531.94831.e0. 16. Zhu Z, Zhou H, Ni Y, Wu C, Zhang C, Ling X. Can dexmedetomidine reduce atrial fibrillation after cardiac surgery? A systematic review and meta-analysis. Drug Des Devel Ther. 2018;12:521-31. doi: 10.2147/DDDT.S153834. [PubMed: 29559768]. [PubMed Central: PMC5856293]. 17. Quan W, Yin Y, Xi M, Zhou D, Zhu Y, Guan Y, et al. Antioxidant properties of magnesium lithospermate B contribute to the cardioprotection against myocardial ischemia/reperfusion injury in vivo and in vitro. J Tradit Chin Med. 2013;33(1):85-91. doi: 10.1016/S0254-6272(13)60106-5. [PubMed: 23596818]. 18. Alam SR, Lewis SC, Zamvar V, Pessotto R, Dweck MR, Krishan A, et al. Perioperative elafin for ischaemia-reperfusion injury during coronary artery bypass graft surgery: A randomised-controlled trial. Heart. 2015;101(20):1639-45. doi: 10.1136/heartjnl-2015-307745. [PubMed: 26310261]. [PubMed Central: PMC4621368]. 19. Bekker A, Haile M, Kline R, Didehvar S, Babu R, Martiniuk F, et al. The effect of intraoperative infusion of dexmedetomidine on the quality of recovery after major spinal surgery. J Neurosurg Anesthesiol. 2013;25(1):16-24. doi: 10.1097/ANA.0b013e31826318af. [PubMed: 22824921]. [PubMed Central: PMC3557800]. 20. Bulow NM, Colpo E, Pereira RP, Correa EF, Waczuk EP, Duarte MF, et al. Dexmedetomidine decreases the inflammatory response to myocardial surgery under mini-cardiopulmonary bypass. Braz J Med Biol Res. 2016;49(4). e4646. doi: 10.1590/1414-431X20154646. [PubMed: 26909786]. [PubMed Central: PMC4792505]. 21. Yang GZ, Xue FS, Liu YY. Use of a meta-analysis to assess the preventive effect of dexmedetomidine on cardiac surgery-associated acute kidney injury. Crit Care. 2018;22(1):85. doi: 10.1186/s13054-017-1853-4. [PubMed: 29587827]. [PubMed Central: PMC5870748]. 22. Liu Y, Sheng B, Wang S, Lu F, Zhen J, Chen W. Dexmedetomidine prevents acute kidney injury after adult cardiac surgery: A meta-analysis of randomized controlled trials. BMC Anesthesiol. 2018;18(1):7. doi: 10.1186/s12871-018-0472-1. [PubMed: 29334927]. [PubMed Central: PMC5769334]. 23. Harskamp RE, Abdelsalam M, Lopes RD, Boga G, Hirji S, Krishnan M, et al. Cardiac troponin release following hybrid coronary revascularization versus off-pump coronary artery bypass surgery. Interact Cardiovasc Thorac Surg. 2014;19(6):1008-12. doi: 10.1093/icvts/ivu297. [PubMed: 25217621]. 24. Tricoci P, Leonardi S, White J, White HD, Armstrong PW, Montalescot G, et al. Cardiac troponin after percutaneous coronary intervention and 1-year mortality in non-ST-segment elevation acute coronary syndrome using systematic evaluation of biomarker trends. J Am Coll Cardiol. 2013;62(3):242-51. doi: 10.1016/j.jacc.2013.04.043. [PubMed: 23684676]. 25. Januzzi JL Jr. Troponin testing after cardiac surgery. HSR Proc Intensive Care Cardiovasc Anesth. 2009;1(3):22-32. [PubMed: 23439987]. [PubMed Central: PMC3484554]. 26. Fellahi JL, Hedoire F, Le Manach Y, Monier E, Guillou L, Riou B. Determination of the threshold of cardiac troponin I associated with an adverse postoperative outcome after cardiac surgery: A comparative study between coronary artery bypass graft, valve surgery, and combined cardiac surgery. Crit Care. 2007;11(5):R106. doi: 10.1186/cc6126. [PubMed: 17888156]. [PubMed Central: PMC2556750]. 27. Sedighinejad A, Imantalab V, Mirmansouri A, Mohammadzadeh Jouryabi A, Nassiri Sheikhani N, Naderi Nabi B, et al. Effect of Selenium on Ischemia-Reperfusion Injury in the Coronary Artery Bypass Graft Surgery: A Clinical Trial Study. Iranian Red Crescent Medical Journal. 2016;19(4). doi: 10.5812/ircmj.42562. 28. Jalonen J, Hynynen M, Kuitunen A, Heikkila H, Perttila J, Salmenpera M, et al. Dexmedetomidine as an anesthetic adjunct in coronary artery bypass grafting. Anesthesiology. 1997;86(2):331-45. doi: 10.1097/00000542-199702000-00009. [PubMed: 9054252]. 29. Kalman JM, Munawar M, Howes LG, Louis WJ, Buxton BF, Gutteridge G, et al. Atrial fibrillation after coronary artery bypass grafting is associated with sympathetic activation. Ann Thorac Surg. 1995;60(6):1709-15. doi: 10.1016/0003-4975(95)00718-0. [PubMed: 8787468]. 30. Chrysostomou C, Beerman L, Shiderly D, Berry D, Morell VO, Munoz R. Dexmedetomidine: A novel drug for the treatment of atrial and junctional tachyarrhythmias during the perioperative period for congenital cardiac surgery: a preliminary study. Anesth Analg. 2008;107(5):1514-22. doi: 10.1213/ane.0b013e318186499c. [PubMed: 18931208]. 31. Guo F, Monsefi N, Moritz A, Beiras-Fernandez A. Selenium and cardiovascular surgery: An overview. Curr Drug Saf. 2012;7(4):321-7. [PubMed: 23030412]. 32. Imantalab V, Mirmansouri A, Sedighinejad A, Naderi Nabi B, Farzi F, Atamanesh H, et al. Comparing the effects of morphine sulfate and diclofenac suppositories on postoperative pain in coronary artery bypass graft patients. Anesth Pain Med. 2014;4(4). e19423. doi: 10.5812/aapm.19423. [PubMed: 25346897]. [PubMed Central: PMC4205802]. 33. Imantalab V, Seddighi Nejad A, Mir Mansouri A, Sadeghi Meibodi A, Haghighi M, Dadkhah H, et al. A comparative study of cardioprotective effect of three anesthetic agents by measuring serum level of troponin-T after coronary artery bypass grafting. Int Cardiovasc Res J. 2012;6(3):70-4. [PubMed: 24757595]. [PubMed Central: PMC3987406]. 34. Lee TW, Kowalski S, Falk K, Maguire D, Freed DH, HayGlass KT. High spinal anesthesia enhances anti-inflammatory responses in patients undergoing coronary artery bypass graft surgery and aortic valve replacement: Randomized pilot study. PLoS One. 2016;11(3). e0149942. doi: 10.1371/journal.pone.0149942. [PubMed: 26930568]. [PubMed Central: PMC4773142].